Today, Belmont Resources Inc. reported that the 3D interpretation of the recently completed gravity survey on its Kibby Basin Property in Nevada has been received from Wright Geophysics Inc. The results have further enhanced the potential to host lithium-bearing brines in a geologic setting similar to the continental brine model ascribed to the Clayton Valley. The company is now extending the land position to the east (to cover a major structure bounding the basin’s east side) and to the north-northeast (to cover a portion of the deep part of the basin). Belmont has received a Gravity Survey Interpretation Report from Wright Geophysics Inc.The detailed gravity survey confirms the large scale structural hypothesis of a pull-apart basin and also added considerable structural detail. A basin model is generated which reveals the basin to be on the order of 4,000 m deep with an east-west asymmetry, the east side being steeper than the west. This asymmetry is similar to the Clayton Valley basin as described by Zampirro in 2003. In addition, the asymmetry appears to be an important control to brine entrapment at the Clayton Valley deposit. A 7.4 kilometer long structure is identified in Kibby Valley with characteristics interpreted to be akin to major structures bounding the south side of Clayton Valley. Figure 1: Modeled Basin Depth over Gray Shade Topography. The figure shows the basin depth or thickness of basin fill beneath the surface. The basin reaches a maximum depth approaching 4000 m with a fair amount of complexity along the basin margins. The overall “Z” shape to the basin, observed by Wright (2016), is even more pronounced in the basin model. As a result of the positive results returned from the gravity survey, Wright Geophysics and Mr. Hunsaker, Consulting Geologist, have recommended extending the land position east to cover the major structure bounding the basin’s east side; and to the north-northeast to cover a portion of the deep part of the basin where it extends northward from the original Kibby claims. The gravity survey identifies several significant structures that juxtapose rocks of differing densities that are most likely basin-fill sediments faulted against the basement rocks. Rockstone is looking forward to a drill program as a sampling of brine at the basin low may result in the discovery of lithium with grades similar to the Clayton Valley when it started lithium production in the 1960s (estimated at >400 mg/L lithium). The model reveals a north – south elongated basin with a depth approaching 4000 m, which is not unusual for basins in the Walker Lane. Of note is the asymmetry in the basin’s east – west profile. Zampirro (2003) reviewed the lithium brine geology and geometries in the Clayton Valley deposit (the 3 figures below present a collection of partial figures from his report). The brines are contained in several layers located along the south margin of Clayton Valley adjacent to the Cross Central and Paymaster Canyon faults, which form the south edge of the valley.Furthermore, the aquifers are controlled by porous layers dipping to the south into the structures and, in the case of the marginal gravel aquifer, ponded by the structures. Clearly, dipping of porous basin sediments toward a major basin bounding structure is geometry conducive to brine containment. A similar geometry is suggested by the basin model and associated structural interpretation for the Kibby Basin. Of course, the model neither predicts the dip of basin sediments nor if the sediments contain lithium brines. Nevertheless, the basin geometry is sufficiently similar to the Clayton Valley deposit as to deserve additional exploration effort. At Kibby Basin the large structure along the east side of the basin would be analogous to the Cross Central and Paymaster Canyon faults in Clayton Valley. As Kibby Basin was pulled apart, one could imagine blocks of basin fill being rotated to the east as the large east bounding structure accommodated the majority of the extension. Other structures and structural intersections bounding the main Kibby Basin should also be considered as possible targets for brine concentrations. Indeed, Zampirro (2003) notes structural intersections may have controlled brine concentration in Clayton Valley. Rockstone is impressed by the results of the recently completed and interpreted gravity survey on Belmont’s 100% owned Kibby Basin Property, which is located 65 km north of the infamous Clayton Valley in Nevada and thus closer to Tesla Motors’ Gigafactory #1 near Sparks, Nevada. The grand opening of the near-by Gigafactory is expected this summer and is anticipated to fuel the next bull phase for junior lithium explorers active in North America. Global media will be reporting in a highly increased fashion about this major inauguration, the last milestone needed to officially start North America’s “green energy revolution”. Most recently, the German government moved to make all cars electric by 2030 (today, only 0.6% of cars on roads in Germany are electric or hybrid, thus the market growth potential is immense). “It would be impossible to halve road emissions by 2030 without legislation that directly or indirectly ushers in a phase-out of diesel and gasoline vehicle production,“ said Oliver Krischer, vice chairman of the opposition Green Party, in an interview Wednesday. “What we need is a boost of e-cars to reach the climate goal that Germany and other countries committed to at the world climate conference in Paris last year.” Merkel’s government pledged subsidies this year to speed EV and plug-in sales, a move that was accelerated by Volkswagen’s emission-manipulation scandal. Currently, buyers of EVs and plug-in vehicles can claim cash incentives. The program may spark sales of about 500,000 electric cars by 2020, according to the Environment Ministry. Purely electric vehicles as a portion of all cars on German roads may reach about 8% in 2025 from 0.6% this year, according to a forecast of the Center of Automotive Management institute. The government has so far stuck with a plan to put a million EVs on the road by 2020 and 6 million by 2030. Despite numerous exploration efforts, no other valley or basin outside of the Clayton Valley in Nevada has yet sampled lithium-rich brines with deep drilling. Belmont is well on track to become one of the first ones, potentially creating a new investors’ focus away from the Clayton Valley, where water rights issues and an official protest from NYSE-listed Albemarle Corp. (>$9 billion USD market capitalization; the only lithium brine producer in North America) have somewhat muted the hopes for the Clayton Valley to become an expandable lithium source for the Gigafactory. As soon as any other basin around Nevada has discovered lithium-rich brines with deep drilling, Rockstone expects a new shift away from the “overappropiated” Clayton Valley. When Clayton Valley’s Silver Peak Mine (owned by Albermarle since 2015) started lithium production in the 1960s, the grades were much higher (>400 mg/L) than today (estimated between 100-200 mg/L) due to depletion of the deposit over time. As the Kibby Basin has potential to host lithium-bearing brines in a geologic setting similar to the continental brine model ascribed to the Clayton Valley, the Kibby Basin may host brine with a similar grade as the Clayton Valley originally had in the 1960s when operations started. 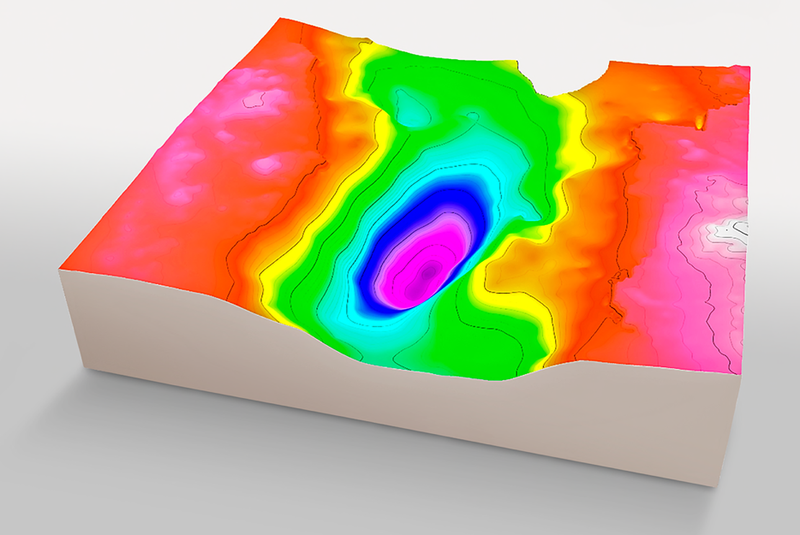 The 3D gravity model on the next page demonstrates the potential for a massive underground brine reservoir with dimensions estimated at 4 km2 and at least 1.5 km deep. On top of all that, the chances of the water being geothermal (hot) are quite good to say the least. Thanks to Belmont’s recently completed and interepreted gravity survey, the Kibby Basin is opined to be the most prospective area (outside of the Clayton Valley) for lithium-rich brines in aquifers below surface.